A page of boat designs and essays. (1 September 2018) We measure prop thrust. The 15 September issue will review taped seams. TIME FOR THE INDIANA MESSABOUT! July 4th is behind us and mid-September is closing fast. We just wanted to send a short reminder that the 26th occurrence of the Lake Monroe Midwest Messabout will be September 14, 15, & 16 -- mark your calendars. Go to https://sites.google.com/site/lakemonroemidwestmessabout/home for additional information and feel free to drop us a line if you have any questions. If you're planning to attend, and want us to add your name/boat/homeport to the website's "Who's Coming" list just send us an email. ...which can now be found at Duckworks Magazine. You order with a shopping cart set up and pay with credit cards or by Paypal. Then Duckworks sends me an email about the order and then I send the plans right from me to you. 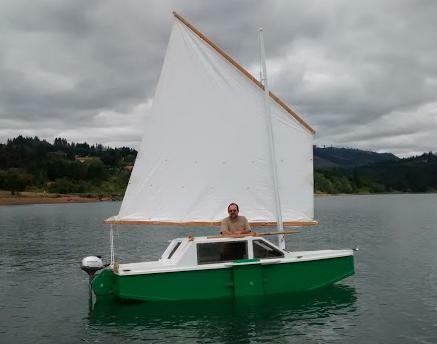 Herb McLeod with the prototype OliveOyl with a new lug sail he made from canvas (with some extra added to the foot). Looks and sails fine he says. 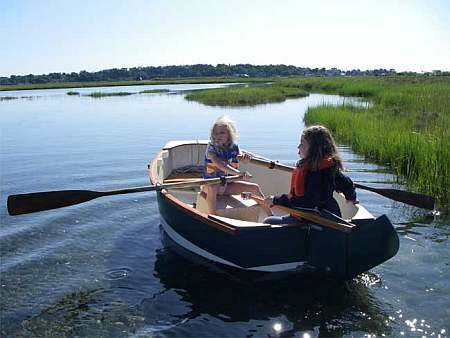 Send $1 for info on 20 boats. "THE MOST SIGNIFICANT NEGATIVE EXPERIMENT IN THE HISTORY OF SCIENCE"!!! Before I get started talking about propeller thrust I want to set the stage with a dedication to Albert Michelson who spent his life measuring the speed of light. Born in Poland, his family came to the US when he was a little boy. He became expert with optics. In the mid 1800's the speed of light was known in a general way and Michelson, along with his helper Morely, made a device that would measure the speed of light to a degree of accuracy never known before. In fact they thought it so fine as to measure the effect of the earth's orbital movement on the speed of light according to the "ether" theory of light propogation that was current at that time. So they measured and measured and measured. They did indeed zero in on the speed of light but saw no orbit effects. The speed of light was the same no matter how it was measured. Michelson had enough confidence in himself that he published the results even though there was no explanation to be had. That was in 1883. Then in 1905 along comes young Albert Einstein who knows about Michelson's results. Einstein doesn't really explain it except maybe to say "accept it because that is the way it has been proven. The speed of light is always the same no matter how you measure it." And with that basis Einstein went on to figure his theory of relativitly and the rest is history. So just because you can't explain something you measured doesn't mean it is wrong. Some of you may recall that I've noted on several occasions the virtues of the program Hullforms. You can link to the Hullforms website in the links at the bottom of my page and download a free trial version. In one of the later trials there is an option that will figure (somehow) a drag vs speed chart for your hull given a certain weight and trim. I don't know how it is figured. In fact I'm not too sure the Hullforms writer took the results all that seriously since he presents several curves using the equations of several professors, and since he didn't put grid lines on his charts leaving you to think they are probably quite approximate. This is not an instantaneous program. 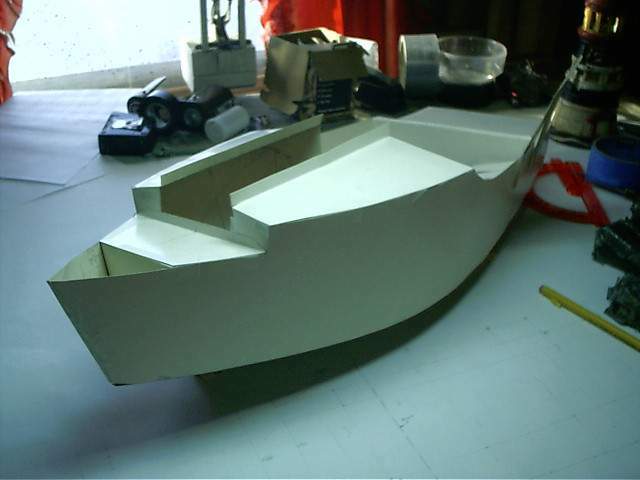 You must "model" your boat first by plugging in the offsets that define its shape and you need to tell it the weight and center of gravity information. Anyway, here is a picture of my Hullforms AF4 model. The Hullforms program predicts for this model, at a full weight of 800 pounds (about real life) and a cg location 11' aft of the stem, this drag vs speed chart (I've added grid lines to make guessing easier). Well now, if such a chart is accurate can Hullforms be used to predict the performance of a boat given a certain weight and trim and power?? ... seems to be something that no one wants to talk about (except trolling motor guys who refuse to talk about horse power). All gas outboards are measured in horsepower. Sometimes someone will tie his boat to a tree and measure the static thrust of the motor, but is that an indication of thrust at speed? The thrust of an aircraft propeller is said to decrease with speed and the thrust of an aircraft jet increases greatly with speed so knowing the static thrust may not be much of a help in predicting thrust at speed. You might recall in the "horsepower" essay from a few issues ago that horsepower is basically speed times a load. Hey! That chart above is speed times a drag so it can be used to figure the horsepower pushing the boat. Does it work? Let's take an example. It is known that in real life my 15 hp motor will push my AF4 at about 18mph tops. But when I look at the Hullforms chart I see that at 18 (about 15.6 knots) mph the hull will have about 120 pounds of drag. 18 mph is 1600 feet per minute so the speed times the load is 190,000 pounds - fpm. A horsepower is defined as 33,000 pounds - fpm so the chart predicts 5.8 horsepower needed to get 18 mph on the AF4! Not much agreement there. I tried to think of ways to measure the thrust at the prop as the boat was underway. 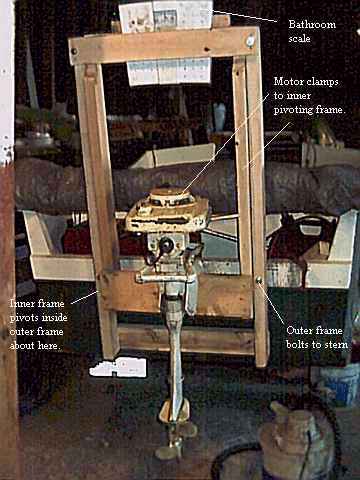 If I were a true tinkerer's mechanic I think I would try something like this: the motor mounts on a transom bracket that is hinged at the top and has a "load cell" sort of thing on the bottom. I thought that might be a small hydraulic cylinder more or less like an auto's brake cylinder with a pipe that leads to a pressure dial on the dash. As the motor pushes forward at the prop the cylinder gets pinched against the transom which is resisted by the oil inside with increased pressure. Read the pressure in the cylinder with the gauge and you can figure out the total force on the cylinder and from there you can figure the thrust at the prop. This could be a permanent thing although I've never heard of it being done. Not being a true tinkerer I settled on a method that relied on 2x4's, duct tape and a bathroom scale. Here is a photo of my Thrustometer. The outer frame of the thing bolts to the real transom. The inner frame which has the motor mount is pivoted inside the outer frame. As the propeller thrusts forward the inner frame wants to swing its top aft. In doing so it pinches an ordinary bathroom scale which you can read very easily. The scale does not read the prop thrust as 1 to 1. Since the motor mount pivot is about 20" from the prop thrust line and the scale is about 33" above the pivot, the actual thrust at the prop is about 1.65 times the scale reading. This bolts to the transom with two small bolts. I don't think it will take for very long the stresses of trailering so I mount it on the hull after the boat has been launched. Also the thrustometer is not braced in any way to take reverse thrust of the motor so that is a no no. I tried to keep the motor mount as close to the real transom as possible so that the motor geometry would be as close to the real use geometry as possible. I thought the limiting factor here would be the motor's clamping handles and I left just enough space for them. But in use I found I can't tilt the motor forward with the thrustometer so care is needed that way in addition to not being able to use reverse. Plan ahead. These bathroom scales are wonderful things and I must take one apart sometime to see what makes it tick. This one cost $3 at Dollar General. When I hang a motor on the Thrustometer it's weight alone puts pressure on the scale. No problem since the scale has a wheel to zero that out so all tests start with zero. 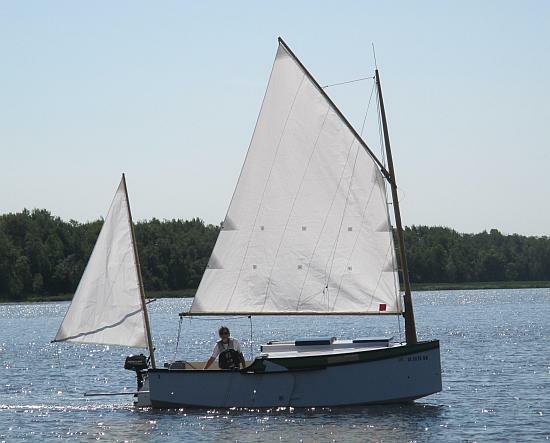 First testing was done with a 1956 Montgomery Wards 12, a Gale made motor that is essentially an OMC. I could tell the moment I popped it into fwd that the Thrustometer was OK. Testing actually only takes a few minutes using a gps. Starting from idle in fwd let the motor and boat settle to a certain throttle setting and write down the speed and scale reading. Increase throttle to a new speed and so forth right up to full throttle. Afterward figure the prop thrust using the 33/20 factor of the Thrustometer's geometry and that is the prop thrust, right? In detail I don't think it really is the prop thrust because the drag of the lower unit never gets into the system. The lower unit drag I think cancels itself out and never gets measured. So the prop thrust is no doubt actually greater than what I am measuring. BUT THAT IS GOOD! I think what is really being measured here is the thrust actually pushing the boat forward. It is the force that counteracts the drag predicted by the Hullforms chart! Also I think that in detail the Thrustometer seems to slow the boat down about 1mph. At least with the two engines I used I got that result both times. It could be the extra weight in the stern, something AF4 has never cared for. Also I noticed a lot of splashing going on back there that is not present usually. The Thrustometer mounts totally above the bottom of the hull so I don't really know what the splash is about. Here is a photo of the Thrustometer in action with a Montgomery Ward's 15 mounted (another Gale OMC motor from about 1960). Here is a chart of the testing results on top of the original Hullforms prediction. I thought they matched pretty well all things considered. The big "hump" predicted by the low speed professor never happened with my AF4 even though I went looking for it with several test runs in that speed range. Perhaps if you are properly prepared you really can use the Hullforms charts to predict speed for new hulls or effects of weight and trim. Note that the MW12 and MW15 lines don't agree above "hull speed". (They were for all purposes identical up to that speed.) I think they should agree and can't think of any reason why they don't. I thought when I did the MW15 tests that the Thrustometer might have been binding somewhere to give the odd results but I ran that motor a second time with the same results. To be sure I gripped the Thrustometer together with my hands which sprung the scale beyond the range of the test and it bounced right back to zero freely when I released pressure. Secondly it is interesting to wonder where all the horsepower goes. 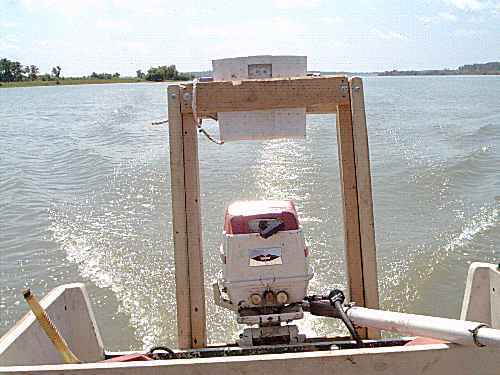 Only about 30% of the rated power is used to push the boat forward. came after I wrote this a long time ago. No, not really from Einstein but I have lost the email over the years. He said my guess that only 30% of the horsepower goes into pushing the boat is about correct! Because even the very best props are only about 50% efficient that way. Over the counter props would indeed be in the 30% catagory. OliveOyl was designed for someone who likeD AF3 but wanted more cabin room and comfort, but not more length. So I actually had some AF4breve drawings handy when I drew the lines for the new boat. Although Olive is the same length as AF3 the cabin is deeper and the bottom a foot wider. One thing the owner did not want, which made the larger cabin possible, was a large cockpit. So I've drawn a bridge deck which extends into the cockpit, reducing foot space there, and also just borrowed length from the cockpit and put it in the cabin. So the floor length in the cabin is over 8'long but you will probably sleep with your feet stuck under the bridge deck. I suppose the downside is that the cockpit is less than 5' long so two adults would fill it. I am guessing an empty weight of 500 pounds but it will take 2000 pounds to put its stem in the water so she should take a fair load. I suppose I've learned a bit since I drew AF3 a while back. One thing I've learned is that when beached a boat like this is much easier to board if the bow is not too high, thus on this boat I've cut down the bow enough so you can sit on it anD swing your legs around right into the cabin entry in the bulkhead, I hope. The owner did not care about that and I don't think she beaches much in her area. Now, the owner wanted a conventional cabin with sliding hatches so I drew that. And with it went a mast mounted on a tabernacle. I drew the mast off center as I normally do, attaching it to one of the main cabin deck beams. That moves it out of the center of the boat where you will be sleeping. 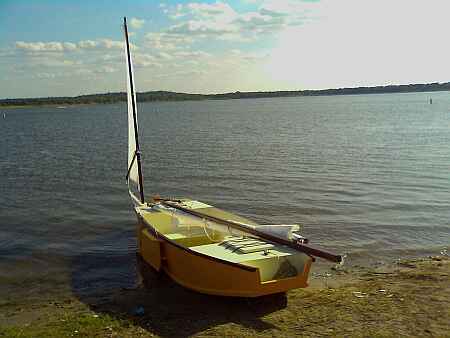 But this boat could be simpler if it had my usual open slot top with a one piece mast. Such a layout would be a lot better I think for a boat which would be sailed off a beach too since it would allow the skipper to hop on the bow after pushing off, and then run upright back to the cockpit. As is he would have to creep down and tHrough the cabin or go over the cabin but I should warn you that, with AF3 at least, standing on the cabin top is an invitation for capsize. After all, these are not large boats. The rig shown is pretty much right out of the AF3 experience, in particular with AF3's balanced lug rig. The spars are short and cheap and the mast short enough that the tabernacle won't be required if the open slot top is used. But I doubt if OliveOyl would stay with an AF3 in a race. She has the same rig but she is wider, deeper and heavier and bound to be slower. On the other hand she is a much better overnighter since the AF3 has a minimal cabin suited for a backpacker. 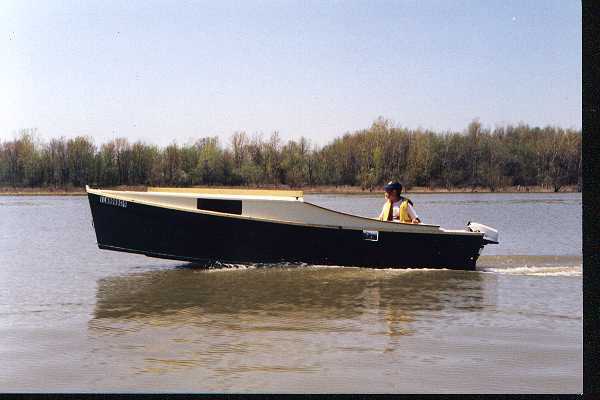 In a lot of ways I think OliveOyl is more of a shortened Normsboat and if you don't mind the extra length and the weight and cost that go with the extra length, Normsboat would be I think a lot more boat for the buck. Conventional nail and glue construction. She needs seven sheets of 1/4" plywood, two sheets of 3/8" ply, and four sheets of 1/2" ply. Plans for OliveOyl are $35. 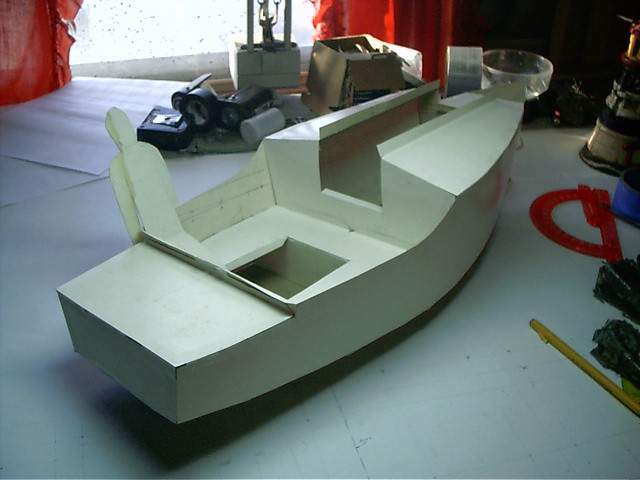 Some of you may know that in addition to the one buck catalog which now contains 20 "done" boats, I offer another catalog of 20 unbuilt prototypes. The buck catalog has on its last page a list and brief description of the boats currently in the Catalog of Prototypes. That catalog also contains some articles that I wrote for Messing About In Boats and Boatbuilder magazines. The Catalog of Prototypes costs $3. The both together amount to 50 pages for $4, an offer you may have seen in Woodenboat ads. Payment must be in US funds. The banks here won't accept anything else. (I've got a little stash of foreign currency that I can admire but not spend.) I'm way too small for credit cards. And the Vole in New York is Garth Battista's of www.breakawaybooks.com, printer of my book and Max's old outboard book and many other fine sports books. Beautiful job! 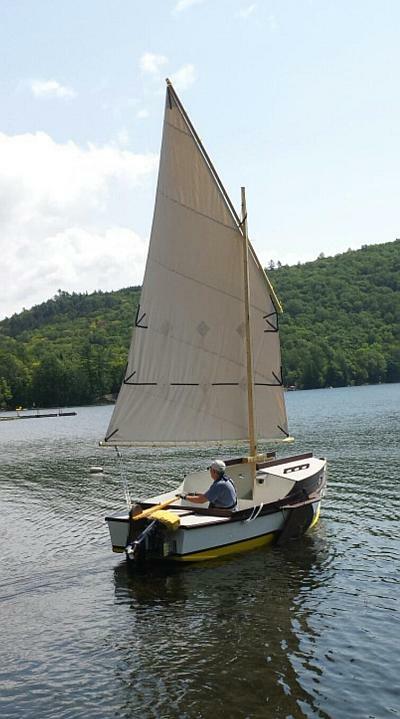 Garth is using a small lug rig for sail, not the sharpie sprit sail shown on the plans, so I will continue to carry the design as a prototype boat. But he has used it extensively on his Bahamas trip towed behind his Cormorant. Sort of like having a compact car towed behind an RV. A brave soul has started a Robbsboat. He has a builder's blog at http://tomsrobbsboat.blogspot.com. (OOPS! He found a mistake in the side bevels of bulkhead5, says 20 degrees but should be 10 degrees.) This boat has been sailed and is being tested. He has found the sail area a bit much for his area and is putting in serious reef points. THE WAY BACK ISSUES RETURN!